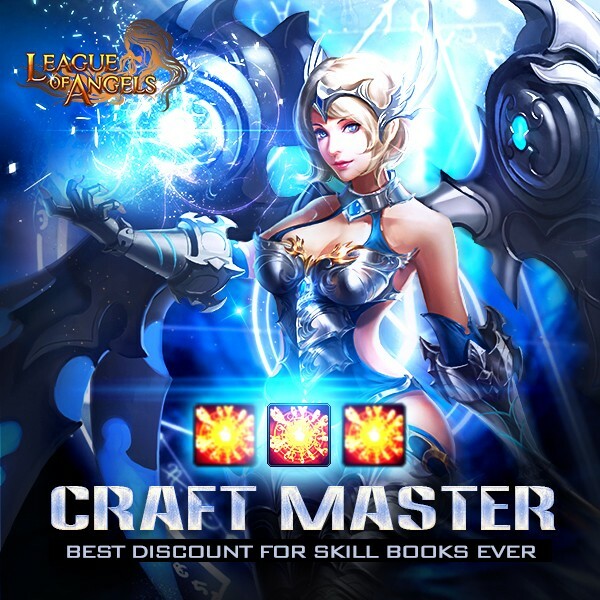 LoA_Craft Master: Best Discount for Skill Books Ever! There are three scenes for player to choose to start archaeological expedition, namely, Grand Library, Dusk Prison and Cloud Palace. For each scene, player will get different fixed output and random output. The fixed outputs are Epic Origin Crystal( Grand Library) , Legendary Origin Crystal (Dusk Prison) and Mythic Origin Crystal(Cloud Palace). The random output may incluade above origin crystals and Philosopher's Stones. After collecting specified materials, you can craft certain items, including Khaos Core, Divine Blessing Stone, Rare Flaming Stone, Adv. Soulstone, Lilac Stone, Mythic Divine Stone, Elena's Icon Shard, Servant's Outfit shard, Lover's Reunited, Element Crystal, Element Scroll, Magic Socketing Rod, Awakening Stone, Lvl.9 Fusion Gem Chest, Lvl. 10 Cherubstone, Lvl. 11 Agility Gem, Lvl. 11 HP+ PATK Gem, Lvl. 11 Dodge+Block Gem, Lvl. 12 HP+PATK Gem, Lvl. 12 PATK + Hit Gem, Lvl. 12 Dodge+Hit, Lvl. 12 Agility+Hit Gem and etc. 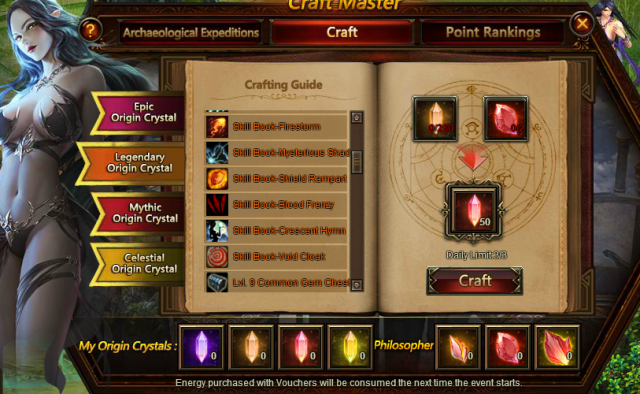 This time Craft Master brings you many skill books with lower discount than before, such as Skill Book-Divine Light, Skill Book-Void Cloak, Skill Book- Shield Rampart, Skill Book-Star Splendor, Skill Book- Mysterious Shandow, Skill Book- Abyssal Gaze, SkillBook- Blood Frenzy, Skill Book-Thunder Storm, Skill Book-Demon Chant, Skill Book-Thunder Strike, Skill Book-Swift Blade, Skill Book-Radiant Guidance, Skill Book-Dragon Fury, Skill Book-Firestorm, Skill Book-Divine Wrathstrike, Skill Book-Eternal Rampart; And other resources such as Runestone, Seraph't Stone, Angel Tears, Grotto Heart and more!